(Photo: REUTERS / Krishna Murari Kishan)Indian security personnel inspect the site of an explosion inside the Mahabodhi temple complex at Bodh Gaya in the eastern Indian state of Bihar July 7, 2013. 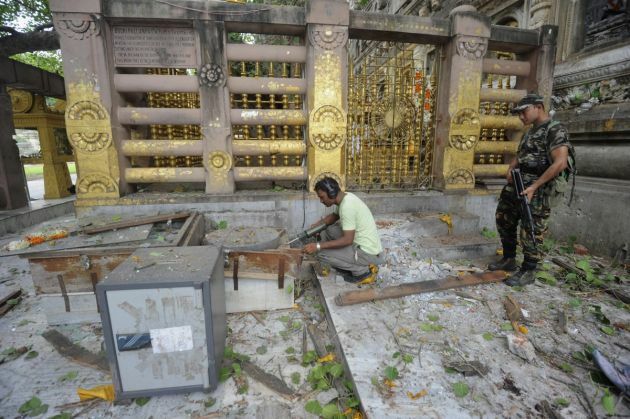 A series of explosions in and around Buddhism's holiest shrine in Bihar injured two persons early on Sunday, in what the government described as a "terror" attack. The Mahabodhi Temple complex is located in Bodh Gaya, the place where the Buddha is believed to have attained enlightenment. The World Council of Churches general secretary, Rev. Olav Fykse Tveit, has deplored recent bomb blasts at the Buddhist Mahabodhi temple complex in Bodh Gaya, in the north Indian state of Bihar. "What has been subjected to attack is not only an important religious site but also the moral fabric of respect for difference and diversity, which encourages and ensures the equality of people of all faiths," said Tveit in a July 16 statement. "This makes the incident even more deplorable," he said. On July 7, a series of 10 bombs exploded in and around the Mahabodhi Temple complex, a UNESCO World heritage site in Bodh Gaya, India. The Times of India reported that five people, including two monks, were injured by the blasts. Three other devices were defused by bomb disposal squads at various locations in Gaya. "We recognize the damage that such unprovoked acts inflict on the religious sentiments of Buddhists across the world and want to let you know that you are not alone in your sense of fear and loss," said Tveit in a letter of sympathy to the Buddhist community in India. Tveit said he was relieved that neither the interiors of the Mahabodhi temple nor the Bodhi tree (tree of awakening) widely believed to be a descendant of the Peepal tree under which the Buddha attained enlightenment were damaged in the blasts. "We acknowledge the very act of targeting a religious shrine as being hugely detrimental to peaceful relations between religious communities, and we condemn the motives behind it." Tveit said that the bombings had stirred an awareness of "the fragility of inter-religious relations across the world." The world churches body leader said the blasts were a reminder "yet again, of the urgent need for people of all religions to commit ourselves more proactively to live in mutual trust and respect." "A time such as this challenges us to demonstrate in concrete terms that the power of hospitality can overcome the power of hostility. "Today this calls us to both a sensitive and perceptive recognition of the globally connected nature of religious violence, and a firm reaffirmation of our commitment to grow in our understanding of our neighbouring faiths so that we may work together in a spirit of inter-religious collaboration and cooperation to further the flourishing of all life," said Tveit. Apple iPhone 7 release date: Device expected this September? Justin Bieber news: Singer to release a new song?